Would rate them higher if I could. Excellent staff. Residents care always comes first. Even mgmt staff comes in to help out. If I ever need this level of care, I'd be glad to have these people take care of me. We are happy with Keystone. Friendly and professional staff. We did check out Keystone Place at LaValle Fields. The facilities were new. I was impressed with them. They were very nice. I felt that their rates are reasonable considering how new the place is. I got a tour of the memory care unit as well as the assisted living, and I think it would have been workable. They have church service like Catholic service and Protestant service, and they have games and activities. It seemed like everyday they have a full schedule of things you could do. Keystone Place at LaValle Fields is very nice. My daughter-in-law’s parents are both there. They had checked out quite a few places before they put her parents there. We’re waiting for a 2-bedroom. It has everything that the other places have but the cost seems to run a little lower than some of them. I like that you can look out at fields; you don’t have to be right in traffic. They sent me an activity list, and I noticed there were quite a few things going on. They have a library, a movie theater, and a pub. We went to Thanksgiving dinner there, and I’ve been to the pub once; the food was not exceptional but very good. The people are very friendly there. That makes a difference, too. Keystone was a very nice place. That would be our No. 1 bet. The rooms were very nice. The dining area was also nice. The whole place was brand new. The staff was friendly and informative. They knew what was going on and answered all our questions. It was everything you could want. My husband moved into Keystone Place last August, and it has been an absolutely wonderful experience. The staff is phenomenal, from the people I first spoke to -- the director, the people at the front desk, the people in the nurses’ office -- to the people in memory care. He is cleaner, and he is shaved every day. They have much better food choices, and they vary chef selections. I see a really good variation of menu. I just can’t say enough about the place. The Keystone Place at LaValle Fields is a lovely and fairly new place. The dining room seemed very nice. The rooms, the common rooms, the library, and the entertainment center room all seemed fine. The folks were very nice and very good to my mother. We moved Dad into Keystone Place at LaValle Fields. We chose it because they specialize in dementia care. The staff is very cooperative, friendly, intelligent about his needs, and very professional. The apartments are very nice and clean. It’s perfect for my dad because it has never been lived in by anyone since the place is brand new, built last November. They have different types of activities, like crafts and games. They also have social meetings as well as entertainment. It was easy to get to Keystone Place at LaValle Fields. I was impressed. It was a multi-level place that's closer to my sister's and my place, which made a big difference to me. It was a very lovely-looking place, and I saw some of the people walking in the hallways. I got a very nice tour of the place. They showed me a studio room but when I told them the kind of care mom needed, they told me she had to be in memory care, so they showed me the memory care where the people stay and I was just kind of shocked because she would be isolated away from people. It was a nice place for people who would like to live in the apartments. It was a brand-new, very pretty place, but it was not appropriate for my mom. When we were in the memory care dining area, the residents were doing some activities. It looked like an excellent place for someone who does not need the kind of care my mom needed. Keystone was a beautiful place. Everything was wonderful, brand new, and beautiful, but it was too far away from my mother. I’d like to recommend it for some other family because it was a great place but just not for us. Thank you for your review and kind words. We are glad you enjoyed visiting our community. I visited Keystone Place at Lavalle Fields. This facility was very nice, convenient, and had everything you needed there. There was a walking area. There were plenty of very nice one- and two-bedroom rooms. They had an exercise room with equipment in it, a beauty salon and a dining room. The dining room was very nice and elegant, yet very friendly. Keystone Place at LaValle Fields. We can not say enough about this facility. Yes it is very new, and yes it is a very impressive place as you wander through on a tour. The food service is fantastic along with the many activities provided. But what really sets it apart from other facilities, is the people inside who are responsible for the care and support of those who have chosen to make this their home. We moved our parents to this facility primarily because it enabled our parents to stay together. It is also close to our home so we are able to visit them often. It has been the third move for them and because of the extraordinary care for both of them and the consideration for each of us, it will be the last move. It is truly the team, who are always carefully chosen, that provide the care and support to the residents and their families. Making this new home safe and pleasant for all. This team from the director to the ladies cleaning, is nothing short of exemplary. For us it was about, will they be safe? will they receive the care and devotion to their well being above anything else? We now know that they will be safe and can see that the team truly provides devotion above and beyond for those who live here and their families. We invite you to take a tour, listen and watch as you walk through and make your own choice. Thank you for your kind words. We are glad you have such a positive experience with us! Stunning facility! You walk in and feel at home right away. The staff are upbeat and friendly. Happy hour was a blast! Lots of activities to do and very accommodating. Transportation services, movie theater and fitness center were above and beyond! Thank you for your review. We are glad you enjoy our community! Thank you for your kind words. We are glad you and your husband are enjoying your experience with Keystone Place. Keystone Place was a brand-new facility, so everything was very nice and plush. It had just opened up in November. The staff was very helpful; they even tried to give me more information and referrals to other places if this one didn’t fit. They gave me books and information about things that would help me. They made you feel at home and welcome. There was a gym and a barbershop and had all the same amenities as a hotel. It was very nice. The dining room was very nice, too. My wife's folk's and her uncle were first to move into keystone and from day one they have taken care of the folks top notch 100% couldn't be any better. The staff have been 100% caring and very efficient. Food is Fantastic! Couldn't be any happier. The building is beautiful well thought out very nice. Bill and the staff of Keystone are truly the most caring and professional people I have come across. Its always hard to leave your family anywhere. However, I never had any concern or problem of any kind. Thank you! I was comfortable with Keystone Place at LaValle Fields when I walked in and I liked what I saw. Michelle, the person who showed me around, was very pleasant, and I got the information I needed. I saw the 2-bedroom 2-bath, a 1-bedroom 1-bath, and there was a smaller 2-bedroom 2-bath. I liked that they have kitchens since I still like to cook. They basically have a full kitchen that wasn't tucked away into a little corner. I was impressed with what I saw. I liked the location, the way it was set up, and that it wasn't on a busy street. We moved my mother into Keystone Place at LaValle Fields. It's a couple of miles from my home, so it's close, and it seems like a really nice facility. So far, we've really been happy with it. The amenities fit all our needs. This place seems smaller than other facilities and just a little bit more fitting for her. Everybody makes you feel welcome and the services they offered fit what she wanted as far as the size of the rooms and the apartments. I liked it better, and felt more comfortable there. I haven't had any issues. I've eaten there and the food is of good quality and there's a good selection. The staff is excellent. Everybody has been very accommodating and very friendly. It's clean and kept up very good. They have a lot of stuff on their calendar, but she hasn't taken part in a lot of it yet. She's still kind of getting used to it. The price is comparable and probably about the same as a lot of other places. Excellent care. Wonderful staff. Clean facility. Great food and activities. Keystone Place at LaValle Fields was really nice and clean. The people were friendly and seemed like they really cared about the folks who lived there. We're in an independent living apartment in the Northeast here in Keystone Place, receiving assisted living services. It is just perfect. They have 2 dining rooms, and they are both beautiful. They have a pub which is just as nice, very spacious, and very pretty. We have 2 patios and 3 rooms; one is a large living room and the other a smaller room, but you can actually have parties, and we've done that several times. It's a very convenient place to be. The staff is good. They are very nice, very caring, and very compassionate. Compared to others that we've looked at, their price is very comparable. It is very convenient to a large city, which is St Paul, Minnesota, and that is where we have our healthcare physicians and doctors. We have a lot of activities every day. We do have an exercise room, an activities room, and a park. We've got a theater here in the building; actually it is a large TV screen and some wonderful chairs that you can fall asleep in while you are watching the TV. If you want to watch a movie, we have movie nights here. My mom is in Keystone Place. They are very helpful and walked us through the whole insurance thing. Everybody has been very nice. The personnel stand out to me. They are very helpful, friendly, and caring. My mom is in a nice, private one-bedroom. It is a brand-new facility. I eat there, and the food is good. The common dining area is beautiful. I will recommend it for sure. Keystone Place was a very nice place. The people were very nice and professional. It was a nice building, brand new and clean. My parents live at Keystone and we can't say enough about how wonderful it is. My dad is in the memory care unit and being well cared for everyday by staff who truly care about each resident. Making this transition for my dad was a hard choice for my mom but after a tour and talking with the administration she truly felt this was the right place for him. My mom lives in an independent apartment just a few steps away from my dad so she can see him everyday. My mom enjoys participating in the variety of activities offered everyday and has made many friends. The staff are friendly and caring not only to the residents but also to their family members. The building is beautiful and well maintained. I would highly recommend Keystone. Welcome to Keystone Place at LaValle Fields! 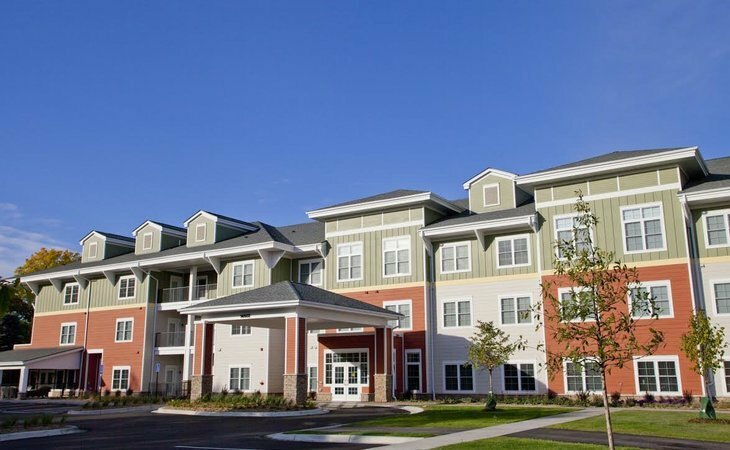 We are a premier senior living community in beautiful Hugo, Minnesota. We offer independent living, assisted living and memory care services for seniors. Yes, we offer delicious meals, clean comfortable and spacious apartments, housekeeping, transportation, daily assistance, etc. These are the basics offered by virtually all senior housing communities. At Keystone Place we are dedicated to offering you so much more. We are committed to improving the very quality of your lifestyle! What should caregivers and potential residents know about Keystone Place at LaValle Fields?